Before going shopping for rice, familiarize yourself with the various types of rice and their preferred usage. It can be divided into types based on shape, methods of preparation, as well as location of cultivation. Based on shape, there are three different varieties of rice: round-grain rice, short-grain rice, and long-grain rice. Round-grain rice contains more starch, and its grains are softer and stickier after cooking. This is ideal for making infusions, rice mash, rice dumplings, rice cakes, and more. Long-grain rice is perfect for risottos, sides as well as standalone dishes. The color of rice varies based on how it was harvested and prepared. White rice has its grains first peeled and then also polished, resulting in its pure white color. A beige color is the result of only being partially peeled, to retain some of its nutrients without the difference in taste. The darkest type of rice is called ‘Natural’ and it lives up to its name by virtue of not being peeled or polished before cooking. This means it retains all its vitamins, minerals and fibers, however its skin contains phytic acid which lowers the rate of calcium and iron absorption. This is why it should be eaten in moderation, preferably with different types of rice in between. It takes a longer time to cook, and it is harder than other types of rice after being cooked. Parboiled rice is not pre-cooked, as many people might believe. It is instead a compromise between the natural and white rice types. Using newer technology in a pressure pot, its skin transfers up to 80 percent of its nutrients into the grain itself, before the rice is peeled and polished. This is why it is a more yellow color before cooking, however it turns a beautiful white color afterwards, absorbing more water than usual. Can’t choose based on the above information? Various types of rice also differ based on their place of cultivation and usage. Arborio is of an Italian origin, and can be used to cook an authentic Italian risotto. Its round pearly grains absorb water while cooking, becoming a creamy mass. Basmati has longer grains and a strong nutty aroma. It is considered a very high quality and mostly used in dishes of Indian cuisine. Carnaroli is very similar to Arborio, with short white grains that become rounder after cooking. It absorbs water well and is ideal for cooking risotto. Forbidden black rice was only allowed to be eaten by Chinese emperors in the past. This is how it got its „forbidden” nickname. Nowadays, it is available to anyone and is a very useful type of rice. It has a noticeable black color, bordering on dark purple sometimes, due to its richness in antioxidants. Eating it helps protect our body from free radicals and prevent various diseases. Indian rice, also known as “wild rice” is not actually true rice. Its dark brown grains actually belong to the American zizania plant, sometimes called water oats. It has a high vitamin B content, and is often added into basmati rice. This black and white mixture looks very good in salads or even as a side. Jasmine rice is similar to basmati, but is stickier. It has a yellow-brown color and a strong flowery smell, thanks to its origin. It is mostly used in Chinese cuisine. Nishiki is the rice used in authentic sushi due to its stickiness and grain size. 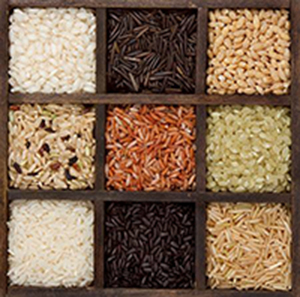 Red rice, also known as Bhutanese rice has very delicate grains, which have a nutty aroma even whilst cooking. While rice is not usually cultivated here, its usage is still widespread and especially valued by people with celiac disease. Rice is generally one of the least allergenic foods, and is suitable for both kids and adults with digestive issues. Despite the many types of rice available, it is recommended to choose ones with the skin still intact, also called “natural”. This is due to the skin’s richness in biological nutrients such as fiber, vitamin B, vitamin E, potassium, magnesium and unsaturated fatty acids. Rice does not cause bloating, which makes it ideal for children and the elderly for usage with a stomach or gallbladder diet. A rice infusion may help with high temperatures and inflammation, ease diarrhea and constipation, as well as treat digestive tract and stomach problems. Rice has a minor effect of inducing waste excretion, helping our body get rid of toxins with urination and prevent kidney stones forming. Rice can be eaten without worry when watching your weight. 100 grams of raw rice has an energy value of roughly 365kJ, but after cooking this can triple. To fully stave off hunger half of this amount is plenty, especially when mixed into a salad.